Spoon, silver-gilt and plique-à-jour enamel. The bowl is decorated in the plique-à-jour technique with a stylized spray of blue flowers (with yellow centres) and green flowers (with centres in two shades of dark green) on a pink ground. The stem, twisted in the upper part, terminates in a spray of a green flower and three blue flowers a like those in the bowl and in the same technique. Purchased from Marius Hammer of Bergen (as from De Keyser's Royal Hotel Ltd, Blackfriars, London EC). Dr. A. Polak (Gullsmedkunsten i Norge før og nå, Oslo, 1970, p.111) notes that Hammer specialized in producing these Art-Nouveau spoons in plique-à-jour enamel, many with a view for sale to tourists visiting Bergen. The popularity in England of spoons in `Norwegian enamel work' can be gauged from Liberty's catalogues. In 1895-96 `Liberty & Co. Ltd draw special attention to their exclusive stock of Norwegian Enamel and Silver-Gilt Goods. The designs, carried out in varied coloured translucent and opaque enamels, are unique and novel, and the workmanship is of the finest. The Enamel and Silver Ware is particularly adopted for Yule-Tide Gifts.' 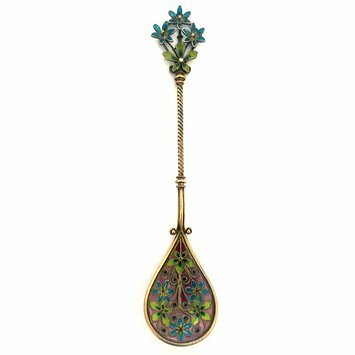 A silver-gilt jam spoon `the top decorated with translucent enamel and the bowl with varied coloured enamels' was offered as such a gift for 18s-*6d. At Yule-Tide 1898 a whole range of `Norwegian Brilliant Enamel Work (Silver Gilt)' was offered with the note that `the present stock of this original and beautiful jewellery is exceptionally full and varied. The examples comprise both the most brilliant translucent and opaque enamels, are of excellent workmanship, and have been specially and exclusively produced in Norway for Messrs Liberty'. `The spoons were sold singly or in the usual cases of half a dozen. For Yule-Tide 1899 the firm had got in a new stock of `exceptionally full and varied', now as `especially suitable for Complimentary Presents'. 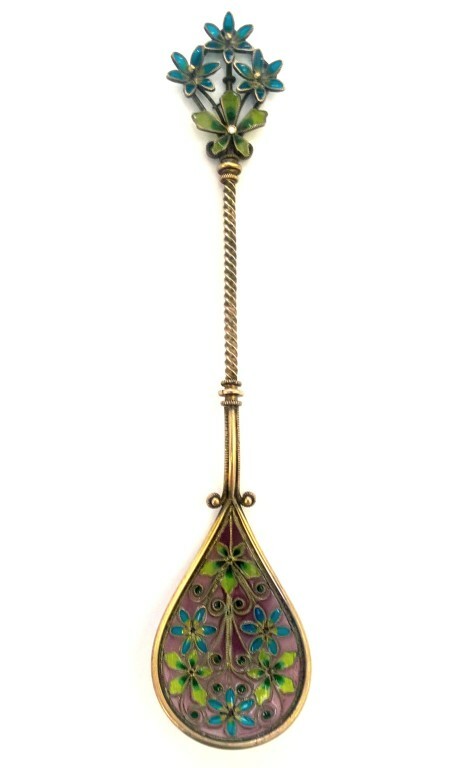 Spoon, silver-gilt and plique-à-jour enamel, Norway, Bergen, 1898, made by Marius Hammer.